AusSpecs offers the largest range of optical Frames and Lenses ! There are only two parts to a pair of glasses obviously these are the frame and the lenses. If either are not up to standard then the specs are not much chop. We use only top quality Optical Lenses sourced from World renown Lens Makers which allows us to state that we can fill virtually any eyeglass script our clients may require. Do even the $38.00 glasses have top quality lenses ? Yes most definitely. Eyes are one of the most important parts of our being and to use second grade lenses would not even enter our heads and would be totally unethical. It is a shame that some others do not follow the same code.. The lenses range from the Standard CR39 material (people call this plastic) with excellent optical quality to the Polycarbonate (thin & ultra-light) Lenses to digital rear surfacing free form lenses. Just a point about lenses and younger children or even those that are into contact sports we highly recommend Polycarbonate (thin & ultra light) for all children's eyeglasses because of its high impact safety qualities. Awfully hard to break but it must be said that they are a little easier to scratch. Obtaining the postilion of your pupils is an important part of producing perfect multifocal / progressive, bifocal lenses. Firstly there are 3 Options. a. Put your glasses comfortably on your face where you normally wear them. d. Do this a couple of time to ensure accuracy. That's it ... simple and nobody can dictate where you buy your glasses. a) Send a photo of yourself facing directly into the camera ensuring that the camera is at the same level as your eyes. Ask your Optometrists at the time of having your eye test to advise you of your segment heights on your old glasses. If you are not able to do this we do have our own proven formula but we far prefer to use real measurements if possible. If this measurement is not on your script then the first thing is to either demand it at the time of having the prescription written and demand it at a later time on phone. You are entitle to the Full script. Measure the PD yourself; You will need a second person to help you measure this distance . 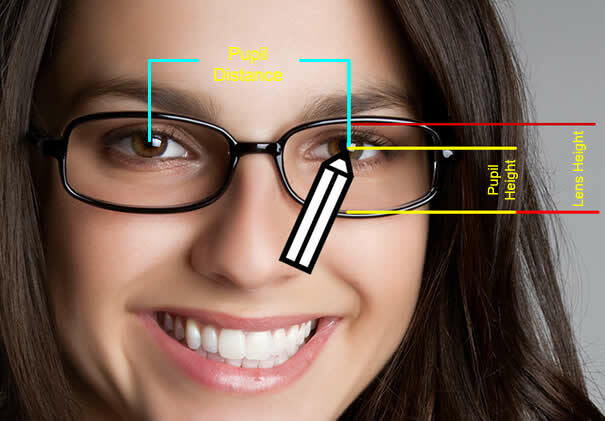 To measure your pupils remember to look straight ahead and into the distance while a second person holds up a ruler and measures the required distance. One good way is to put a mark on an old pair of glasses and then measure this distance. The PD is important to us to ensure your glasses are aligned properly when we make them for you. The same is true for what we now call Progressive lenses. The following Flash Presentation on the Reading, Intermediate and Distance focal points of the Multifocal Lens shows how limited we really are in the viewing area of the lens and also points out that those that are expecting to don a pair of Multi-focal eyeglasses and see as clearly and as easily as we did as kids are often disappointed. Check this out.. this is something we knocked up to show you what to expect when wearing a set of standard (Not Free Form) Multi Focals . You will notice that the viewing area is in fact pretty small hence people have to move their head from side to side to view. Although these are called Multifocals they really are only 2 focals. Distance and Reading and the little bit in the middle that some people use for computer is really tiny. Not the best option. Can everyone wear Multi-Focals ? No not all people are suited to wearing these types of Optical lenses and some can never get used to them. It is just a fact of life but look on the bright side, with the low prices offered by AusSpecs at least you a not greatly out of pocket to find this out for yourself. One of the most common reasons is that with multifocals you need to turn your head to focus on an object rather than just move your eyes. Past generations have had to put up with and adapt to this method so that it is now second nature. This takes some getting used to and some re-training of the brain before it becomes second nature. There are other, also medical reason for not being able to wear progressive lenses but fortunately the vast majority of us that need them can get used to them eventually. The quality of the Eyeglass Lens is also a very important factor. Only use manufacturers you trust or have been recommended to. Technology today is progressing in leaps and bounds and the optical industry is not being left behind. If you do not like having to move your head to see the peripheral areas of view through the standard Multi-Focal lenses then you should consider the free form range of Lenses. Although a little more expensive these are definitely worth trying. The latest technology alloys for up to a further 30% wider vision in the mid range and eliminates the distortion on the left and right of the "far" vision zones. Question : If the free form is so good then why offer the standard multifocals for sale. Answer : Easy, the older generation had no alternatives to the standard Multifocals and after a lifetime of wearing then it is very hard for people to adjust to the new lenses. So realistically we only recommend the new free form lenses to new or near new wearers who have no grown up with the old technology. That said they are still leaps and bounds better than the old tech so they are worth a try ! That said, we do not advertise the old tech for sale but can supply on request. Are you sick to death of putting your computer glasses on to read the screen and then removing them to see the paperwork right in front of you. You are not alone and that is where Extended Readers come to the fore. Do not be confused. Standard Computer glasses are just single vision glasses with the focal points set to the distance you sit from the computer... computer glasses ! In the past we have only have the option of either Multi-focals (which have a very small Intermediate Viewing area) or Bifocals (which sort of do the job but not exceptionally well). Clearly a new lens was required for this application and it had to fulfill the requirement to have wide viewing areas for both reading documents and the computer screen. It also had to be specifically focused on the distance value (normally around 80cm) a person sat from the screen and they had to get rid of the pesky line across the lens. Fortunately this has now been achieved and yes we offer this lens at the cheapest price in Australia !